One of the best things about affiliate marketing, and digital marketing at large, is the possibility to measure your efforts. You can literally track anything online — where the visitors came from, what they clicked on, what device they used, what internet connection served them, what banner or landing page performed best and many more. Nevertheless, being new to affiliate marketing usually brings a lot of “how-to” questions to the table. How to properly set up tracking in order to get all this information? How to use a tracker? How to launch a 1st campaign in the tracker and optimize it from now forth? The answers are right in front of you, just keep reading this article. First thing first, let’s determine what exactly a tracking solution is. And how it actually works. The concept is always best illustrated through an example. Let’s imagine the simplest possible case. You go to offervault.com, choose the offer you want to promote, for example, iPhone X Sweepstakes for Latam GEO. Then you create several pre- landers or some super appealing banners, and start running mobile traffic to the offer. and the most conversions happen between 7 pm and 11 pm. This is all data that a tracking software will collect for you! How does the tracker know which click has converted into a sale? Thanks to the assigned ID, a Network knows that this particular visitor has done the desired action that caused a conversion. Then, the Network send this ID to the tracker, “telling” that this visitor converted. The tracker, on its side, pulls out all the information about this ID and conversion, i.e. ROI, cost, CR, as well as the country where this conversion has come from, what time of day, from which OS and many more. Thus, we can enclose that a tracking software (or tracker) collects all kind of information about the visitors that, in turn, allows you to find your profitable traffic segments and the non-profitable ones. This, in turn, opens a whole new world of opportunities for your marketing campaign optimization and profit increase. How to use a tracker and launch your first campaign with it? First to mention, that there are several well-known and highly performing tracking solutions on the market. Despite some differences in paid subscription plans and some exclusive features, each of them is optimized for paid traffic management and performance increase. No matter which one you choose, the process of setting a campaign is pretty similar for each of them. 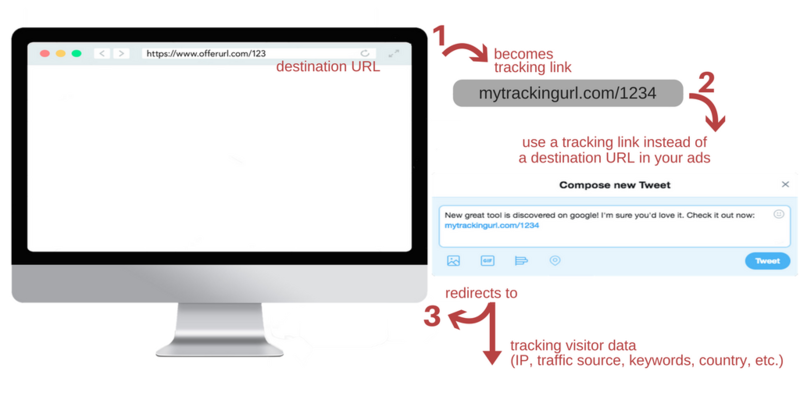 Since an image is worth a long wordy description sometimes, RedTrack.io team made a simple infographic for you. It shows you the sequence of all the steps you should go through while creating your first campaign in the tracker. Again, all these steps are relevant for any tracker. Those who just start tracking the performance of their marketing campaigns might sometimes feel overwhelmed with the range of new optimization possibilities it offers. Here and now, the key thing you should understand is that a tracker is not about tracking the number of visits and clicks. At least, not only. It goes way deeper than that: track conversions and impressions, cost of a click for each of your traffic sources, the performance of numerous variables (geo, device type, time, etc. ), publisher’s data (ad location, landing page effectiveness, referral links) and many more. Down the line, the more experienced you become with performance marketing, the simpler it becomes to track and optimize your efforts. As you gain more, you learn new tactics and approaches for maximizing ROI. Managing advertising campaigns isn’t easy, but tracking them should be! Don’t know which tracker to choose or miss some features with your current tracking solution of choice? Then, you might want to check out RedTrack.io – advanced tracking & analytics platform. Only for Offervault Scoop readers, they give away a special promo-code – OFFER-SCOOP. Use it while sign up and get 25% discount within your 3 first months of RedTrack subscription. New to affiliate marketing and want to test the waters with performance campaign management software? Sign up for their FREE plan and track up to 50,000 events/month for free. Our company has been using HasOffers for 5+ years – is RedTrack a solution other affiliate networks are using? or more focused on individual affiliate tracking?